I’ve had a bit of a game-buying drought as of late. I’ve walked into my 3 favourite game stores (in Toronto) – Gamerama at Yonge & Eglinton, EB at Yonge & Eglinton, and EB Games at Yonge & Steeles, – and have come up relatively empty for several weeks now (I bought Unreal 2 for $10 out of desperation yesterday). I was really jonesing for a nice cheap game purchase; not necessarily for the game, just the purchase, ya know? So I thought I’d look into my crystal ball and try buying a game off of Valve‘s content distribution system, Steam. Steam is the distribution system first made mandatory by Half-Life 2, Valve’s 2005 game of the year as voted by countless publications including my favourite, PC Gamer magazine. Upon installing the game from storebought discs the user must make an account on Steam, activate the product over the internet, download any patches (optionally), and start playing. Steam must log into Valve’s servers before even the single-player version of Half-Life 2 can be played, but for those with a stable internet connection (not me) this is a much preferred alternative to leaving the CD in the drive. Having recieved HL2 from a friend I simply needed to enter his password and start playing. Many early-purchasers noted some trouble with Steam due to high volume, but most were up and running minutes after installing. It should be noted that Steam can be downloaded by one and all for free, and any game, including Half-Life 2, can be purchased and downloaded without taking a trip to the store at all. 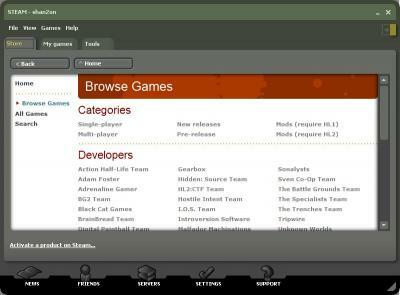 Valve opened up Steam’s embedded web store with its classic roster of titles – the original Half-Life series including its 2 expansion packs, accompanied by the odd third-party shovelware title. Since its illustrious launch, Steam users may choose from an ever-growing list of titles by increasingly prestigious developers such as Lionhead. My game of choice was Half-Life: Source – the original Half-Life game rendered by Half-Life 2’s Source engine. It’s the same game that I’ve played at least 3 times through already, but as PC Gamer’s game of the year for 1998 it has a ton of replayability. This is the game responsible for transforming the first person shooter genre from baseless free-for-all splatterfests to a storytelling medium of unmatched personal weight. Half-Life was the first FPS to unfold in real time entirely in the first person perspective. I clicked Half-Life: Source from a surprisingly disorganized roster of dozens of games and was presented a variety of bundles: purchase the game standalone or bundled with Half-Life 2. Having already changed most of the account settings from the previous owner’s, I was simply prompted to enter my billing information (which isn’t required by Steam until you make a purchase). I clicked another button or two and the game immediately appeared on my list of available games. The game automatically began downloading (at about 110KB/s) and was completely installed and updated within 40 minutes. I was emailed a reciept and given the option to print a copy. The total came to $10 USD, no taxes, no fees. I tested ‘er out and it worked perfectly. The game looks very slightly better than the original – it uses the higher-res (but still very pixelated and muddy) textures from the Blue Shift expansion pack and it incorporates Half-Life 2’s specular lighting and water effects, but otherwise it’s the same old Half-Life – and that’s a great thing! I look forward to giving this old favourite another good run-through. It’s a toughie! Overall I am quite pleased with my Steam experience. After enduring maybe 10 fruitless visits to brick and mortar stores it was a pleasure to see a game I wanted, buy it, and play it in less time than it takes to drive to and from a store (granted this is an older 1-CD game). Of course there remains the issue of Steam’s demise – what happens to all this purchased content if and when Steam disappears? Will Valve generously unlock all their content to be played freely? Or have we all been renting the game from Valve as long as Steam works? We shall see, I suppose. In the end, am I as pleased with my Steam purchase as if I had gone to a store and bought a box? In a word, no. Although Half-Life 2’s packaging was disappointingly sparse (quick reference card instead of a manual, paper CD sleeves) it’s still a package. I have those lovely printed CDs and the very attractive box that sits nicely on my, er, pile of boxes. In truth, I don’t even have a place to put these boxes. It’s obvious that game stores will soon be a thing of the past, but considering the price of the 8-year-old game I bought it would have been nice to have something to hold in my hand. Nevertheless, this bias will surely disappear as we become more accustomed to the trade of intangible goods in years (or less) to come.